From The Ukrainians in Rhode Island: Faith and Determination (1988) by Rt. Rev. John J. Mowatt. pages 9-12, 16-18. Religion was always an important part of the life of the inhabitants in all the towns and villages of Ukraine. Ukrainian immigrants to the New World attempted to recreate this religious milieu, so one of their first concerns was to construct churches for their local communities. Since religion is such a vital and integral part of Ukrainian life and culture, the history of Rhode Island Ukrainians cannot be understood without examining the development of these churches. When the Ukrainians began arriving in Rhode Island in the late nineteenth century, they formed church communities, church-related organizations, and benevolent societies while earning their living in Providence, Pawtucket, and Crompton. The early years were extremely difficult, often unbearable, but most of the immigrants settled and adapted to their new home. The first arrivals consisted mostly of men. They were young, eager, venturesome, and ready for new horizons. The mills employed them in the least desirable jobs and at the lowest pay, and the climbed the job ladder very slowly. Those pioneer immigrants to Rhode Island were from western Ukraine’s small towns and villages: Birka, Skalat, Brody, Zbarazh, Berezhany, Radehiv, Rusiatyn, Ternopil, Rohatyn, and Yavoriv. By 1903 the immigrants realized the need for the formation of a church which would suit the needs and customs of the Ukrainian people. Just before Easter of that year the first Ukrainian Catholic liturgy was celebrated in Woonsocket’s Precious Blood Roman Catholic Church by Rev. Teofan Obushkevych. 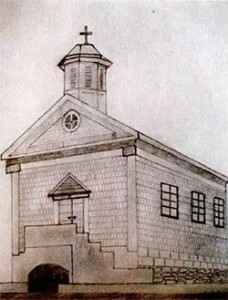 Shortly thereafter St. Michael’s parish was established and a hall (Now St. Joan of Arc Church) was rented in Cumberland Hill for religious activities. Fathers Wolkaz, Ukycki, Winarski, Zaklansky, and Lewinsky cam from out of state at regular intervals to minister to this embryonic parish. By the fall of 1907 the congregation had divided into two groups. One group established a Russian Orthodox parish in the village of Manville, in Lincoln [Holy Dormition Orthodox Church, now under the Orthodox Church in America -ed. ], while the church in Cumberland Hill remained Ukrainian Catholic and received a permanent pastor, Rev. Michael Struminsky, in December 1908. Father Struminsky organized the parish and conducted services in Lyceum Hall. The new parish was incorporated and received its state charter on January 5, 1909. In June of that eventful year the parishioners purchased a building at 164 West School Street, Woonsocket, which they remodeled into a church. They also constructed a rectory in the read of the church. These undertaking left the new parish burdened with a mortgage of $5,500 [about $130,000 in 2015 dollars – ed.]. In 1910 a new pastor, Rev. Vladimir Dowhovych, arrived and organized Branch No. 206 of the Ukrainian National Association. The branch was named Zaporozska Sicz after the famous Cossack fortress (sic). A third pastor, Rev. Basil Turula, came in 1911. Three years later a cemetery was purchased for $1,500 [$35,000 in 2015 dollars -ed.] and the church debt was paid in full. At this time the parish was growing rapidly with the arrival of many new immigrants. Families were reunited and births boomed. The number of Ukrainian children baptized in 1914 is recorded as 1,290; the number of families totaled 600. A parish choir was organized was organized that year under the direction of the composer Michaylo Hayworonski. Such growth prompted Father Turula to acquire property on Blackstone Street in Woonsocket for a larger church. This new acquisition, which cost $7,750 [$182,000 in 2015 dollars – ed. ], included a building that could be converted to use as a rectory. 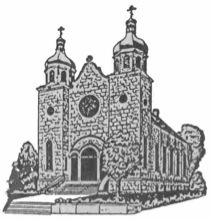 In 1917 another parish, St. Stephen’s (Ukrainian Catholic) Church was organized in Manville. Father Turela ministered to both the Woonsocket and Manville parishes. Between 1920 and 1922 the Woonsocket congregation was served by the Reverends Michael Kuzmak, Volodymyr Kozoriz, Antin Lotovich, Volodymyr Obushkevych, Myron Zalitach, Yuri Krupa and Roman Volynec. Construction of the new church in Woonsocket began in 1923, at a building cost of $62,000 [$861,440 in 2015 dollars], and the old church was sold in 1924 for $8,200 [$111,300 in 2015 dollars]. At the that juncture Rev. Onufri Kovalsky came to serve the congregation. The new church on Blackstone Street was blessed by the Most Reverend Constantine Bohachevskyj on September 24, 1924. In 1925 Rev. Hlib Verchowsky arrived as pastor. The 1920’s were a period of turmoil in many Ukrainian-American church communities. Dissatisfaction with the clergy and many other irreligious and cultural issues divided church members. In 1926 the Woonsocket [Ukrainian -ed.] Catholic congregation divided into two groups; the larger one became independent and later joined the Ukrainian Autocefalic Orthodox Church [under Metropolitan John Teodorovych -ed. ], while the other remained Ukrainian Catholic and maintained union with Rome. A court trial involving rights to the church building lasted twelve years, costing both sides a total of over $15,000. Father Verchowsky held [Ukrainian -ed.] Catholic services for approximately forty families at Trinity Hall during the dispute because the Orthodox group had gained control of the church property. The present parochial community of St. Michael’s Ukrainian Orthodox Church was formed in 1926 when its founders separated from St. Michael’s Catholic parish. For twelve years following the schism, the new group of Orthodox worshippers maintained control over St. Michael’s church property. The Reverend Maxim Maruschak became the first Orthodox pastor of the newly established parish on July 22, 1926, but his stay was short-lived, for the following year Rev. Joseph Yaletchko came to serve the congregation. St. Michael Ukrainian Orthodox Church School in 1930. Note that this was taken when the Orthodox Church met on Blackstone St. In 1928 the Very Reverend V.A. Kaskiw was appointed as pastor. During his tenure the parish flourished. Father Kaskiw organized the Ukrainian School and the church choir and, of course, performed the religious services. At this time there were two hundred children enrolled in the Ukrainian School. The youth were well organized and participated in numerous cultural performances and religious services. “St. Mike’s” Boys Club had a basketball team which won many championships in the YMCA League, and the club was very involved in other athletic and social activities as well. In August 1938, after the Orthodox parishioners were ordered to relinquish control over the Blackstone Street church by Supreme Court decree, Rev. Demetro Leschishin was appointed to replace the Very Reverend V. Kaskiw. Orthodox church services were then held at different locations throughout Woonsocket. Within two years, however, Father Leschishin, together with the spirited parishioners, negotiated to purchase the present parish propter, a house known as the Cavedon Homestead, located at 74 Harris Avenue, Woonsocket. In October 1942, after many people gave of their time, labor, and money, St. Michael’s Ukrainian Orthodox Church, built at a cost of over $70,000 [$1,060,441 in 2015 dollars -ed. ], was blessed. Parish organizations such as the Zaporozska Cicz, the Ukrainian Women’s Society of St. Mary, and the various youth clubs helped to finance its construction through their donations and their loans. The Manville Orthodox parish of St. Michael donated the bell for the new Woonsocket structure. In 1944 the Very Reverend Peter Bilon was appointed pastor. he was followed by Rev. Anthony Beryk, Rev. Demetrius Sawka, and Rev. Stephen Holutiak (aka Hallick). During Father Holutiak’s pastorate the interior of the church was decorated with the painting of icons, and an iconostasis was installed. Two talented artists, Mychaylo Osinchuk and Peter Cholodny, were commissioned for this work. Their craftsmanship has been acclaimed by many critics. Parochial life has continued to flourish under the leadership of Fathers Bilak, Mostensky, Krasevich, Kowalenko, Oryhon, and the present pastor, Rev. Mykola Krywonos. In recent years the church has been refurnished, the parish hall extended, and the rectory renovated. St. Stephen’s Ukrainian Orthodox Church of Manville, Rhode Island, whose beginning was very similar to St. Michael’s [formed in 1917, converted to Orthodoxy in 1927], was merged with the Woonsocket parish in the late 1970’s [St. John’s Ukrainian Orthodox Church, formed in 1921 in Providence, was closed at about the same time -ed. ].